We offer all residential and commercial heating, air conditioning, ventilation and water heating services. Whether you need gas or electric furnace service or repair, furnace installation, heat pump or air conditioning installation, tankless hot water heaters or water heater replacement, better air flow and air quality in your home, energy savings, or you just need a filter change, Schmidt Heating and Cooling is your best choice for Cincinnati and Northern Kentucky heating and air conditioning. 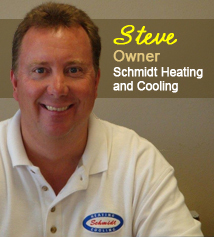 Schmidt Heating and Cooling is committed to complete customer satisfaction and customers are our main focus. Our mission is to be the best heating contractor in the Greater Cincinnati Area. We understand that to be the best heating company in the area, we must be able to provide the highest quality and most energy efficient air conditioning and heating products in the greater Cincinnati area. Schmidt Heating and Cooling is also your local expert when it comes to water heaters and endless Tankless Hot Water systems. We're also your Indoor Air Quality experts and Energy Efficiency Experts with a full product line of air cleaning and energy efficient heating and cooling products. Along with the best warranties in the business, we always guarantee 100% Satisfaction to our customers. Serving Greater Cincinnati since 1953! Charter Member of the Greater Cincinnati Heating and Air Conditioning Contractors Association. Member of Air Conditioning Contractors of America. Only - Quality - Name Brand Equipment Installed. All personnel are Company employees, NO subcontractors. Job supervision, including follow-up to explain the operation of all new equipment. All of our factory trained installers are in uniform, drive lettered company trucks, and are bonded. All employees participate in continuous education programs. Building permits are always included on all quotes. All warranties are factory registered in your name. Annual Service Agreements are available to maintain you equipment for many years. Factory trained service department available 7 days a week if a problem arises. Financing plans available on new equipment installations with credit approval. 2% cash discount on new equipment installations if paid with check or cash on the day of completion. We accept all major credit cards.